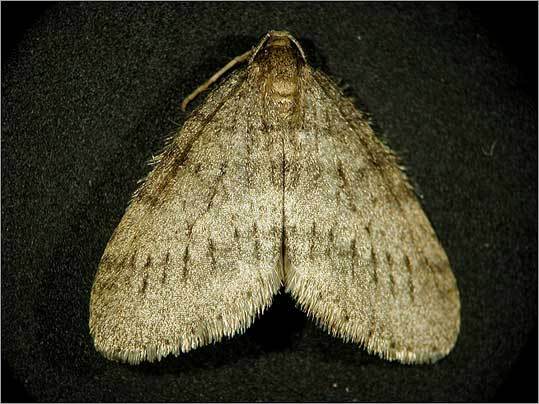 The winter moth (above) can't be blamed for gypsy-moth ravaged oak leaves, but the cure for the infestation could be similar. Suddenly, it seems, they are everywhere. They are spooky, especially at night - swarming porch lights, windows, and even car headlights in massive fluttering clouds. They are winter moths, 1 trillion strong in Massachusetts at last estimate. They are enjoying as bumper a mating season as local entomologists can recall, and if left unchecked may pose a serious threat to the region’s flowering plants and shrubs next spring. There is no formal moth census, said Joseph Elkinton, an entomologist at the University of Massachusetts at Amherst and one of the state’s leading authorities on the insects. But anecdotally, there is no question that the winter moth population is abundant this fall, and gradually heading westward from Greater Boston, he said. “It’s slow, but clearly expanding,’’ said Elkinton, who last week was checking pheromone-laced traps that his laboratory set up in trees along Route 2 in Concord to track winter moth migration toward Worcester. There is no simple answer to what is causing the current proliferation, he said, but temperatures over the past few years have provided favorable breeding and feeding conditions for the brown moths with an approximately 1-inch wingspan. The rainy, warm nights this fall have also been hospitable to the mating dance of the winter moth, which closely resembles its native, less populous cousin, the Bruce spanworm moth. The winter moths, which scientists think originated in Nova Scotia and migrated to New England over the past two decades, will likely be in their very conspicuous “flight’’ mode for the next few weeks, local experts said. In this stage, male moths swarm and mate with wingless females, who leave a scent trail as they search out a vertical surface - a tree, the side of a building, a fence or even lawn furniture. Successful females endeavor to lay their eggs - up to 150 each - in trees where early spring buds will provide food for the larvae, usually in late March and early April. With a moth population this dense, Elkinton said, as many as 1,500 females may lay eggs on a single tree, potentially producing as many as 250,000 hungry caterpillars per tree. Not all the larvae will live, but the surviving bugs can defoliate and seriously damage native flowering trees, especially fruit species. A tree will often die after three to five years of moth infestation, Elkinton said. Rolf Briggs, founder of a Holliston-based company, Tree Specialists Inc., said he and his arborists have been getting more than a dozen calls daily in recent weeks from homeowners panicked by the invasion of unfamiliar insects. “The good news we can tell people is that they are harmless now, they are annoying but they don’t eat anything or hurt anything right now. They don’t bite or sting, and they are basically flying around looking for a wife,’’ said Briggs. At greatest risk are apple and blueberry growers, he said, who are familiar with the moth and already making preparations for next spring to deal with the hungry larvae whose first choice of a meal is flowering fruit plants, followed by maple and oak trees, he said. By March and April, Briggs predicts, local tree-care specialists will be actively spraying pesticide for the larvae all over Eastern Massachusetts. Homeowners with low-to-the-ground foliage can use chemicals purchased from a local garden store to stop the moths from chewing through their shrubbery, Briggs said. Another UMass-Amherst entomologist, Bill Childs, said the area’s moth infestation may appear severe, but it is actually much worse in coastal communities on the South Shore, Cape Cod and Martha’s Vineyard. “It is a very substantial infestation in those areas, and we aren’t entirely sure why it is there, and not so much of an issue west of Worcester,’’ Childs said, noting that regional temperature differences are almost certainly a factor, but more study is required to develop a definitive answer. Meanwhile, Elkinton is among a group of entomologists searching for a natural predator to help keep the winter moth population under control. The university’s Extension Service is experimenting with introducing Cyzenis albicans, a parasitic fly that was effective in bringing the moths under control in Nova Scotia. The fly, first introduced two years ago in a handful of trees in Wellesley and other test sites around the state, shows early signs of being effective, but it may take another five years to make a significant impact on the moth population, Elkinton said. Ultimately, the state hopes to duplicate its success in controlling gypsy moths, another invasive pest that overwhelmed the region starting in the 1980s but was eventually brought under control through the use of an insect-killing fungi native to Japan, Entomorphaga maimaiga.